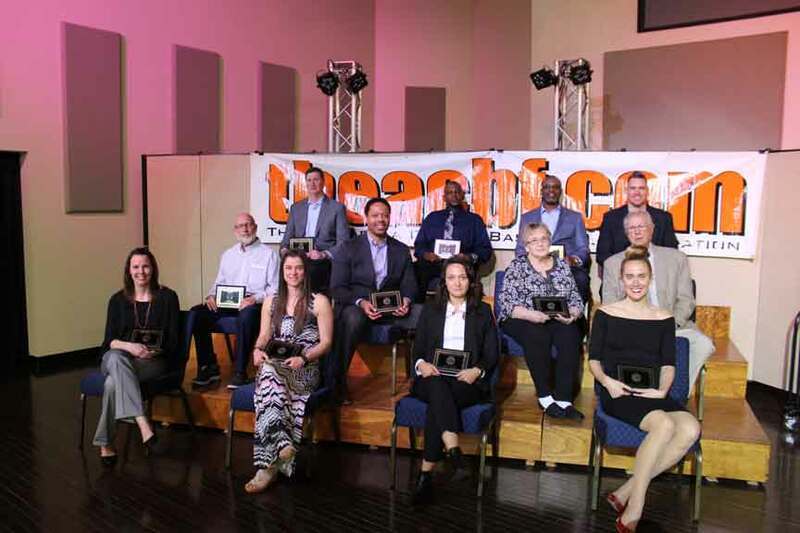 The 2019 Ashtabula County Basketball Foundation Hall of Fame Inductees were: Terry Thompson (1984 Ashtabula), Mike Pape (1995, Conneaut), Anthony Lyons (1995, Conneaut), Pam Dreslinski (2004, Edgewood), Jordan Cuddy (2003, Geneva), Lou Bishop (1958, Grand Valley), Jeff Fink (1984, Jefferson), John Bradley (1977, Harbor), Renee Freeman (1999, Pyamtuning Valley), Ned Roach (1971, Pymatuning Valley) and Kelly Tinney (2003, St. John). The Ashtabula County boys coach of the year went to John Bowler, of Edgewood, The Ashtabula County girls coach of the year was: Jeff Compan, of Pymatuning Valley. The Ashtabula County Basketball PLyaer of the Year nominees were: Brandon Ford and Makenna Condon, of Lakeside, Mike Ferl and Annalee Hagstram, of Conneaut, Hayden Kanicki and Katie Eldred, of Edgewood, Brandon Strang and Hannh Root of Jefferson, Nick Stoltz and Jordan Vencill, of Geneva, Austin Roberts and Ashley Hall, of Pymatuning Valley, Dante Accettola and Genesis Foltz, of Grand Valley, Jacob Artman and Emily Cevera, of St. John. The Ashtabula County girls basketball player of the year went to Ashley Hall, of Pymatuning Valley. The Ashtabula County boys basketball player of the year was Hayden Kanicki, of Edgewood. Four players were honored for reaching 1,000 points in their career including; Nick Stoltz, of Geneva, Hannah Root, of Jefferson, Hayden Kanicki, of Edgewood, and Ashley Hall, of Pymatuning Valley. The Alumni Achievement Award went to Jessica Vormelker, Grand Valley graduate, for her basketball career at Thiel College and being named an All-American. The Edward Jones/David Flautt scholarship went to Hannah Root, of Jefferson. Rawley Huskey received the official’s appreciation award. Mia Martino, St. John, Maddeline Hitchcock, Jefferson, Janessa Stell, Edgewood and Kaleigh Stell, Edgewood, received the ACBF Coaches/Referees Award. The ACBF trustees are Michael Joslin and Nicholas Iarocci. The Board of Directors include: President Brad Ellis, Vice President Andy Juhola, Secretary John Higgins and directors Chris Larick, Doug Dladek, Bob Hitchcock, Ed Armstrong, Al Goodwin, Becky Olmstead, Dawn Zappitelli, Steve Kray, Tim Mizer, Ralph Turk and Executive Administrator Michael Bartone. Pictured: The Ashtabula County Basketball Foundation 2019 Hall of Fame inductees pose for a picture during the ACBF awards dinner on Sunday, April 7 at the New Leaf Event Center. From left to right, front row; Renee (Freeman) Drake, Pam Dreslinski, Jordan Cuddy and Kelly Tinney-Malm. Middle row: Ned Roach, Anthony Lyons, Paula Bishop and Jim Dodd (Bishop and Dodd represented the late Lou Bishop). Third row: Jeff Fink, Terry Thompson, John Bradley and Mike Pape.